Thirdgen experts, I am on a mission to find a clone of my first thirdgen. An 85 base Sport Coupe hardtop with an LG4 V8 in dark blue. It had black cloth interior and the only option it had was A/C. Did not even have the rear spolier. 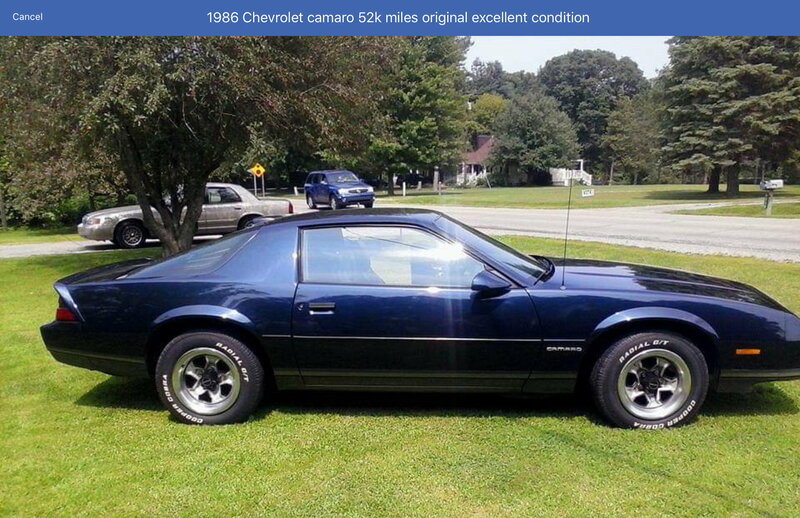 I drove the original car itself into the ground and eventually sold it for $700 with 179,000 miles on it, and I am pretty sure the the kid I sold it to wrecked it shortly after. I have so many great memories in the car I just would love to have one again. I had bought it when I was 20 years old. It was not new when I bought it. My younger brother was working at Chevy dealer by my house detailing and porting cars in Glendale Heights, IL and it came in on a trade. My car old clunker Buick had just died and I left it abandoned in the university parking lot. I came home for thanksgiving break and the car was just traded in. The used car manager offered it to my brother for cost because it was a no option car and they took forever to sell. And so for a steal of a deal it came back to college with me. Ray, had found an 86 that was pretty close to it. But the guy never responded to me and it was an 86 with that stupid light. Here is a pic of the car Ray found that is the right color and wheels. If any one finds one of these in dark blue please let me know. I would really appreciate it. Last edited by burnout88; 02-02-2019 at 10:30 PM. Ray seems to know where all the cars are.. but I’ll keep my eye peeled.. The SCs are pretty rare..
Good luck, Brian. I'll keep an eye out. Thanks not a bad find, the price is insane for a Coupe. Not sure I am that sentimental! Unfortunately, that is the light blue color and not the dark blue. The color seems to be really critical but if it’s a Coupe I find myself looking at it. Your absolutely right, it’s seems very few coupes survived. Most fell victim to what happened to my own Coupe driven into the ground and then destroyed. Thanks Charlie, I know this is like a needle in a haystack search but maybe with a few people on the look out I may luck out. I’d bet that price is quite negotiable.. It is a little insane.. I hear you on the color.. You might be able to find a decent one, but maybe not the color you want.. It’s worth waiting.. I really wanted a 5-speed Vert but I went with the flame red with an Auto because I always loved that color and reminded me of my first IROC.. 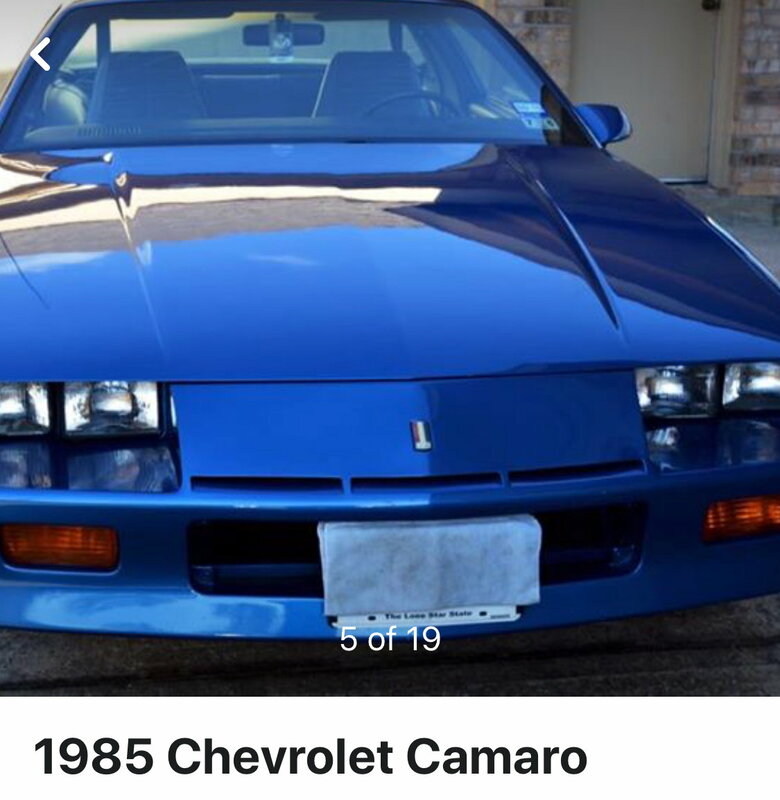 I passed up some great cars to get the color I wanted..
i saw this car before you posted it up but the seller is out of his mind on the price for a car of this caliber ..
That’s a 4K car tops. I have actually found a few really nice ones but all the wrong color. Just can’t get that excited about them. I am thinking this is going to be a long wait but I know it’s out there somewhere! Good find, that is the correct color. But it does looked crunched in the quarter. But the real deal killer is it’s a vin S car. 2.8 v6. No V8. That car looks awesome Ray! Wow, that is a great Sport Coupe! How do you find these cars! It’s the light blue instead of the dark blue but I just might have to make an exception. Ttops,5speed and the nicer seats! All great options on a Coupe. But why does it have to be 2,000 miles away! Shipping will cost me a solid $1,500. Also a little worried about hidden rust being a NE car. Going to give this one a real good look. 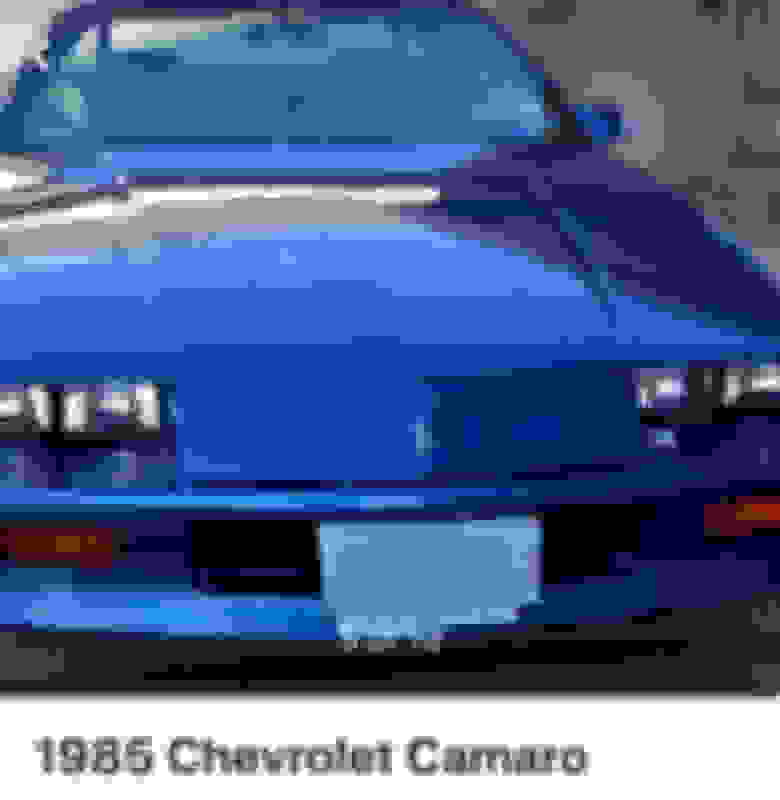 Last edited by burnout88; 02-09-2019 at 07:09 PM. Help me find my first third gen! My First post, My First Thirdgen, My first Question!